People with diabetes have a higher risk for heart attacks and strokes. 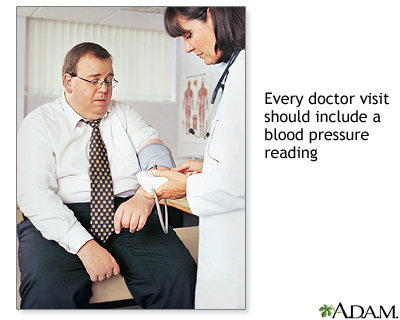 Your doctor or nurse should check your blood pressure at every visit. Ask your doctor what your target blood pressure is. Exercising (such as walking), eating low-salt foods, and losing weight (if you are overweight) can lower your blood pressure. If your blood pressure is too high, your doctor will prescribe drugs to lower it.